If we are to make sense of the type of art form that digital games are and could someday become, it is critical to understand the new sensorium — the experiences of temporality, speed, space, protocols, and history — that they open up. This talk turns to the independently produced 2008 platformer videogame Braid. The central mechanic that Braid adds to the usual platformer repertoire is the manipulation of time. 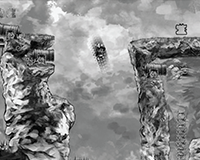 Each “world” in the game is subject to a different set of temporal rules that affect the player’s ability to solve puzzles. By intertwining narrative, visual, audio, and algorithmic components, this game interrogates the impulses that drive videogames and the historical subjects that they produce. Through strategic complicity with the activity-oriented attitude that has characterized both Cold War politics and videogames, Braid encourages a powerful form of self-reflexivity in the player. By exploring Braid’s commentary on the history of videogames, I suggest that the procedural operations of the form provide an aesthetic horizon for the experience of our information-oriented, postindustrial society. If cultural works are fields through which the dynamics of different media and modes of production can be apprehended then Braid is, ultimately, a multi-layered exposure (or indeed a “braiding”) of the logics that underlie the contemporary military-industrial-entertainment complex. Patrick Jagoda is an Assistant Professor of English at the University of Chicago. He is also a coeditor of Critical Inquiry. He specializes in new media studies, twentieth century American literature, and digital game theory and design. Specifically, his scholarship examines how contemporary American fiction, film, television, and digital media aestheticize global networks (including terrorist networks, economic systems, and computer webs). His publications appear in such journals as Critical Inquiry, Social Text, Post45, and Neo-Victorian Studies, as well as edited volumes such as The American Novel 1870-1940 and Cyberspace and National Security. Jagoda has also worked on several projects related to digital storytelling, transmedia game design, and new media learning. He is the co-founder (with Melissa Gilliam) of the ongoing Game Changer Chicago initiative, a project that uses transmedia game production to promote participatory and systems-oriented forms of health learning aimed at adolescents. This initiative has received support from several organizations, including the MacArthur Foundation and the Wohlford Foundation. In 2012-2013, Jagoda will pair with digital media artist Sha Xin Wei for a narrative-oriented transmedia game project supported by the Mellon Fellowship in Arts Practice and Scholarship at the Richard and Mary L. Gray Center for Arts and Inquiry. Jagoda received his PhD in English from Duke University in 2010 and was a Mellon postdoctoral fellow at the University of Chicago from 2010-2012.